Lingering oral infection can lead to illness elsewhere. John G. Pate began a career in journalism at the age of 19 when he got a job in the public relations office at the University of Houston, Texas. He went on to write for both the Houston Chronicle and the Houston Post, where he was an investigative reporter. Now 84, John enjoys another career as a transactional specialist in real estate. In addition to negotiating property deals, John is also a professional speaker and a member of Toastmasters International. To relax, he spends time at the beach, fishes and tries his hand at gourmet cooking. A few years ago, John had to give up a lot of the time he devotes to those activities to seek advice on an unusual dental issue that suddenly surfaced. “My dentist noticed little bone fragments in my jaw,” John describes. “I knew that at one time, I had an unerupted wisdom tooth, which apparently was the source of the problem. I went to several dentists who all told me I needed oral surgery, which I wanted to avoid. I thought the procedures they recommended were overly expensive and very invasive. That dentist was Alfons Bucaj, DMD, of Dental Implant Center of Vero Beach. Dr. Bucaj impressed John from the start. The dentist evaluated John’s situation and told him surgery wasn’t necessary, especially since he was not experiencing any uncomfortable symptoms. 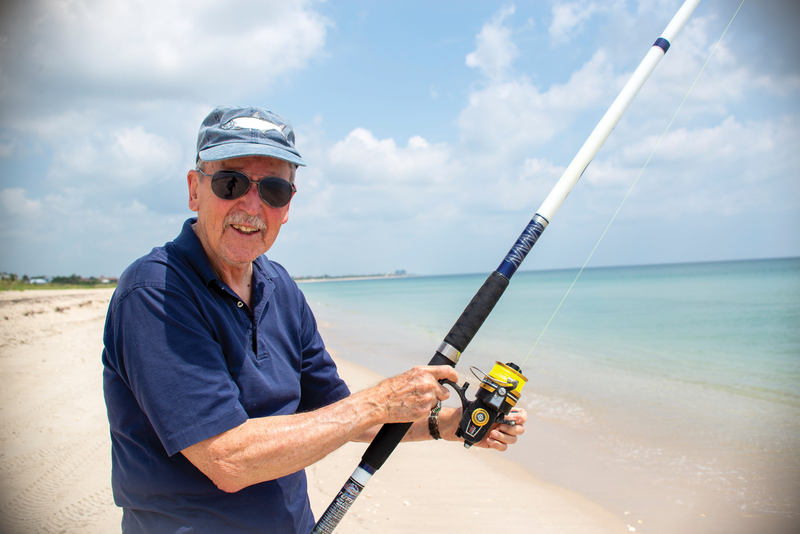 John did return to Dental Implant Center of Vero Beach when he began having pain on the other side of his mouth and his family dentist didn’t know why. John assumed it was the same problem occurring, bone fragments from an unerupted wisdom tooth. But this time, it was causing pain. When John returned to Dr. Bucaj, he wanted the dentist to remove the wisdom tooth on his left side and eliminate the bone fragments. John felt certain this would ease his discomfort. The infection in John’s jaw concerned Dr. Bucaj. He didn’t want that infection to spread beyond John’s mouth to other areas of his body where it could cause significant illness. Immediately, the dentist prescribed a course of antibiotics to eradicate John’s infection before it could disperse. Dr. Bucaj remembers when John came in reporting the left side of his mouth didn’t feel right. It bothered him all the time. Dr. Bucaj points out that John’s other dentist had neither the training nor the equipment required to pinpoint the cause of John’s problem. “Here at the Dental Implant Center of Vero Beach, we have advanced training and technology, including bone scans with three-dimensional imaging,” states Dr. Bucaj. “We were able to determine John had a severe chronic infection in his lower left jaw. For John, clearing up the chronic infection was a game-changer. In addition to the ongoing discomfort it caused him, the infection in John’s mouth threatened his overall health. 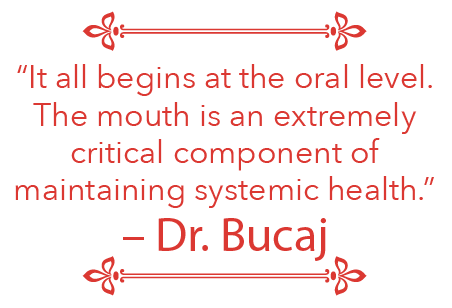 “There’s an oral-systemic connection,” explains Dr. Bucaj. “The bacteria from the infection in the mouth can get into the bloodstream, which initially causes a low-grade fever. That’s when people begin to feel tired and lethargic. When it gets into the bloodstream, it becomes what we call a diffuse infection. 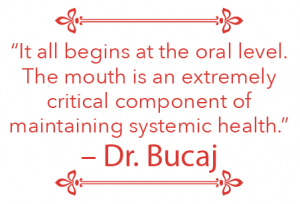 Dr. Bucaj stresses that all of these complications are absolutely unnecessary and any related symptoms can be alleviated if the infection is detected and treated in the mouth. Dr. Bucaj intervened in time to keep John’s infection from spreading beyond his mouth to other areas of his body. Thanks to the dentist, the jaw issue on John’s left side is resolved, and he’s healthy. John is glad he made the decision to seek a second opinion from Dr. Bucaj. He’s also happy with the dentist and his staff. His experiences with the practice and its people have been very positive. “I think the quality of the experience depends not just on the doctor but on the quality of the staff,” comments John. “From the moment I walk in the door at Dental Implant Center of Vero Beach, the receptionist makes me feel calm and relaxed. The dental assistants and hygienists are extremely good people as well. The excellent results John received from Dr. Bucaj have him singing the dentist’s praises. He wants to tell more people about the dentist and his practice. “I told Dr. Bucaj that with his practice, his ethical standards and the thoroughness with which he treats his patients, more people ought to know about him,” asserts John. “I’ve referred several people to him, including a loved one.